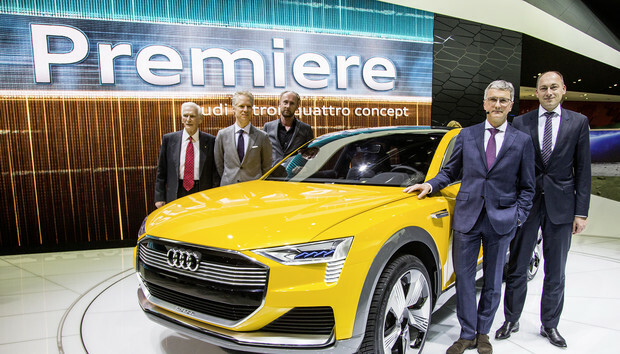 Audi unveiled a sporty SUV concept powered by a hydrogen fuel cell at the North American International Auto Show on Monday. Hydrogen fuel cells convert hydrogen gas into electricity, harnessing the most abundant element in the universe to power a vehicle with the only byproduct being water vapor. The technology is in its infancy, but concepts like Audi's show that automakers believe hydrogen has a serious chance to replace gasoline in hybrid cars of the future. The Audi h-tron quattro has two electric motors, one for the front wheels and one for the rear, with the hydrogen tanks at the back and the fuel cell where the engine usually sits. The car manages 0-100kmph (0-62mph) in less than 7 seconds and has a top speed of 200kmph. The interior is also pretty high-tech, with Audi's virtual cockpit, curved OLED screens, LTE connectivity and tablets to keep passengers in the rear seats entertained. There's also "smart butler" software that promises to help owners organize the luggage compartment. A key benefit of hydrogen fuel cells is a fast fill-up. It takes about 4 minutes to refuel a hydrogen car, roughly the same as a gasoline engine and many times faster than an all-electric car. There's only one hydrogen production car available today. Toyota's Mirai is being offered in small numbers in Japan and California. But the lack of refueling stations effectively limits its range at present, as early buyers are finding out. The Audi h-tron quattro has a range of 600 kilometers (373 miles), so if there's no filling stations along the way, it means drivers would be able to travel a respectable 300kms (186 miles) before having to turn around and return. Also on Monday, Toyota showed its hydrogen-powered Lexus LF-FC to a North American audience for the first time. First unveiled at October's Tokyo Motor Show, the LF-FC is paving the way toward the first hydrogen-powered Lexus, due by 2020. "Building on our proven fuel cell technologies with this Lexus concept, we hope to achieve a total of zero — zero emissions, zero dependence on oil," said Akio Toyoda, president and CEO of Toyota, as he presented the car. Toyota previously said the concept represents the future technology direction for its flagship sedan range. The appearance of the concept car at the auto show doesn't mean it will be available any time soon. Several hydrogen concepts were shown at the event last year and are not in production, but it's clear automakers are paying attention to hydrogen fuel cells and the benefits they may bring. However, for all the talk of cleanliness, there is an important caveat. At least at present, most of the hydrogen used to refuel these cars is produced using natural gas, so ultimately the car still relies on fossil fuels. There are cleaner ways to produce hydrogen, so this could change in the future.